Today I'm using only pens. 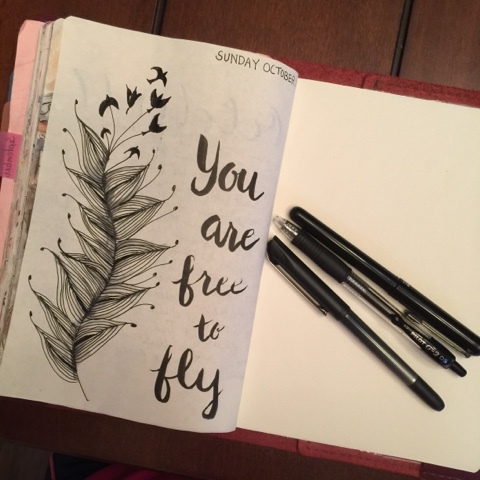 I used Uniball Vision Needle to draw the feather, Pilot G-2 to shade with an aquabrush and Pntel Pocket brush pen to hand letter. Featherfall is the zentangle pattern I used to create the feather. I always found this pattern hard to manage. It's not a difficult pattern but I can't make it do what I want and I can never predict the outcome. And perhaps that's the zen part of zentangle. If you would like to learn this pattern you can find the instruction here. Or you can watch the YouTube Instruction. Several times in my art learning process, I felt that I was on the verge of a breakthrough, whether it was learning a technique or defining my style. But something keeps holding me back, keeps me tethered to the ground. And as you might guess, what keeps me tethered is me, my own lack of confidence or my fear of the unknown and the fear of making mistakes. Intellectually, I know confidence comes when you learn from making mistakes, when you let go of your fears. When I was a teacher, I was known as a risk-taker, someone who embraced change, new methods, new thinking. I helped develop processes and curriculum that made learning student-centered rather than teacher directed. I was able to do this because I was able to let go of the notion that I had to know everything and be confident to go explore things for which I had no answers. But as an artist, I feel like I'm my own worst enemy, always holding back and it frustrates me. But I keep trying, exploring, and learning from mistakes. And I hope one day, I'll be of one of those birds what breaks away from the tether.. Thanks, Ann Marie! I love images that transform from one thing to another!